It has become routine that whenever a foreign report is released - whether by a government or an organization - on intellectual property rights (IPR) protection, China in the vast majority of cases seems to be the most popular target of criticism. So, when the US Chamber of Commerce's Global Innovation Policy Center (GIPC) released its International IP Index on Thursday, it was no surprise that the report repeated the usual unsubstantiated, biased accusations against China, despite a slight rise in China's scores in the very same report. In the GIPC's 2019 International IP Index, which assessed the IP environments of 50 world economies in the past year, China had an overall score of 21.45, slightly up from 19.08 in the 2018 report. China's ranking in the index was unchanged at 25. While China's score was significantly lower than that of the US, which had the highest score of 42.66, it was higher than most other emerging markets. Brazil had a score of 18.25. India had a score of 16.22. South Africa's score was 15.55. Still, that did not stop the GIPC from repeating the US' long-held grievances against China, from alleged forced technologies to lack of protection for foreign IPRs. "Although some policies have been revoked, many of these policies are still in place and continue to be introduced," the report read. However, like most of the previously released reports that contained such claims, there were no anecdotes - let alone data - that could support the claims throughout the GIPC's 256-page report. "A common problem of these reports is that they have no accurate data," said Chen Xinxin, a research fellow at the Institute of Law of the Chinese Academy of Social Sciences. Furthermore, Chen told the Global Times, foreign reports tend to paint the Chinese government as intentionally supporting infringement of IPRs. "Many of the IPR violations do not only exist in China but in all the other countries as well," he said. Coincidently, the GIPC's claims are perfectly in line with US officials' concerns raised during ongoing trade negotiations between China and the US to end a trade standoff. Chinese officials have long denied such claims and frequently pointed to their efforts in strengthening IPR protection. Chen Danzhou, an assistant professor at the School of Law at the University of International Business and Economics in Beijing, suggested that the GIPC's report could be politically motivated as part of the US' push to contain China's technological rise. At the very best, the organization is ignorant of China's efforts over the years, he said. "In recent years, China has made huge progress regarding IPR protection," Gao Feng, a spokesperson for the Chinese Ministry of Commerce (MOFCOM), told a briefing on January 31. He said that so far, China has established courts specifically for IPR protection in Beijing, Shanghai and Guangzhou, South China's Guangdong Province, and set up courtrooms in 19 cities. China has also stepped up its efforts in IPR-related legislation and law enforcement with several large-scale crackdowns, he said. Several high-profile IPR cases last year also served as indication of China's strengthened protection of IPR. 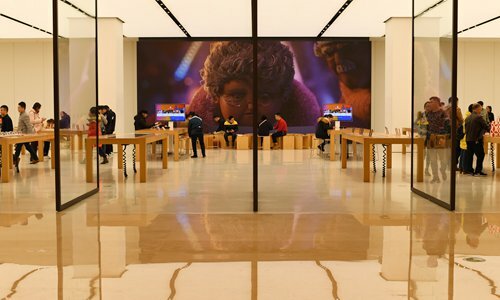 One such case involved two US companies - Qualcomm Inc and Apple Inc. On December 10, a court in Fuzhou, East China's Fujian granted Qualcomm's request for Apple to stop infringing two of the former's patents. "This shows that China's IPR legal system has gained global influence and companies' confidence. Otherwise, Qualcomm wouldn't sue Apple here," Chen Danzhou said. Unlike what the report suggested, foreign investors appear eager to invest in China. In 2018, foreign investors set up more than 60,533 new companies in China, up 69.8 percent year-on-year, according to data from MOFCOM. Also, China attracted $134.97 billion in non-financial foreign investment, up 3 percent year-on-year, the data showed. The GIPC report said by improving IPR protection, a country is 39 percent more likely to attract foreign investment and 33 percent more likely to receive private-sector spending in research and development (R&D) activities. In 2018, Chinese companies were estimated to spend $60.08 billion in R&D, up 34.4 percent year-on-year, marking the largest growth globally, according to a report from global consultancy PwC. "There are definitely some areas where China needs to improve in protecting IPR… but these problems are not unique to China and it's not like China is intentionally letting it happen," Chen Xinxin said.